The children live in the Residential Unit in one 4-room unit (includes rest room and shower facilities). 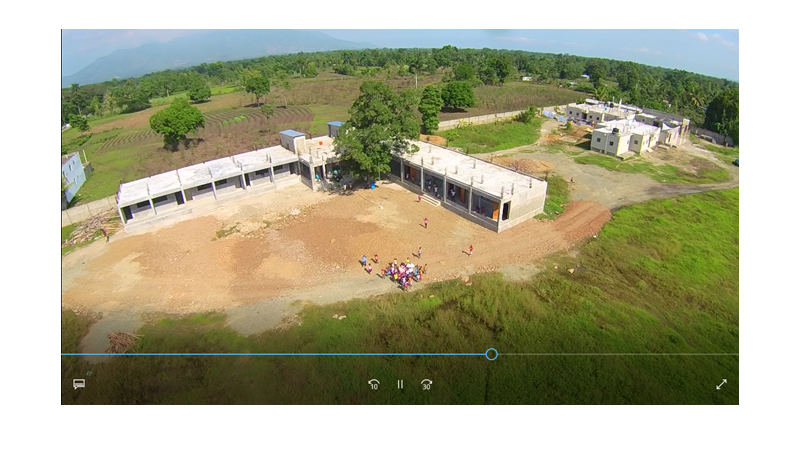 Ultimately, it will have 4 units for 25 children each … two on first floor / two on second floor … for a total of 100. It currently has a completed Dining Hall with a separate adjacent kitchen building. Major component to be completed is the double height, multi-purpose room which we are currently developing the steel roof structure for. I pray we may construct this in the fall after the sister’s residence is completed … the highest priority at present. The four Sisters of Mary live in the other unit until their residence is completed. The K-6 school is in operation …serving his children and those of surrounding, rural land. Second story being added to a portion at present. See photo from early June trip – attached. 1. A Library /Study Hall Building for the students … adjacent to the residential complex. Fr. Andre only told me about this on our recent trip so I am currently working on preliminary designs. 3. A Chapel that would serve both his children and staff and surrounding community. He needs to keep the size at a scale so as to not offend the pastor of church at Plaine de Nord. 4. Medical Clinic that would serve both his children and staff and surrounding community. With the Univ. of Notre Dame School of Nursing across the street on a growing campus … this could be a great teaching facility as well.